I am indebted to Rosemary Dixon-Smith, of Durban, Natal, South Africa for the material from which I have formulated this article. Rosemary diligently undertook to locate the name QUALTROUGH in South Africa for me by responding to a query I left on a genealogy message board at http://rootsweb.com . And I was not to be disappointed as I was aware that a Thomas QUALTROUGH "went to Africa " (See Chart 11 of A QUOTA OF QUALTROUGHS ). Rosemary was quickly able to locate a family of Qualtroughs from her indexes and from there research began. This family turned out to be Thomas Henry Qualtrough, his wife Emily Mary and two children, Margaret Emily and Edward Henry who just happen to have lived in Durban, so research was fairly easy for Rosemary to undertake. Thomas Henry Qualtrough turned out to be the Thomas who "went to Africa". He was born about 1875 in Rushen, Isle of Man, son of Evan Qualtrough and Margaret Isabella Gray. He met and married his wife Emily Mary CRELLIN, daughter of John James Crellin and Margaret (maiden name unknown) Crellin, on 12 July 1911 at St Thomas, Douglas, Isle of Man and almost immediately they left the Isle of Man, for England (probably Liverpool) and from there they emigrated to South Africa. They settled in Durban and within a year their first child was born. Margaret Emily Qualtrough was born on 27 May 1912 and followed two years later by a son, Edward Henry (later known as Henry Edward) Qualtrough, born 14 August 1914. They lived at 66 McArthur Street, Durban and from there Thomas supported his family as a carpenter. Emily would have filled in her days as wife, mother and housekeeper to her family. However her health must not have been the best as she died at Addington Hospital, Durban on 23 July 1925 aged 48 years and one month. She is buried in Stellawood Cemetery, Durban. She left her husband Thomas and her two young children Margaret aged 13 and Edward Henry aged 10. This must have been a very sad time for the family, Thomas being left with two small children to bring up. It is not known whether there were other relatives to help – certainly no Qualtroughs, but perhaps Crellin relatives may have been there, who knows – but whatever happened, Emily’s death had a formidable effect on the children, especially, her son Edward Henry. Nothing more is known of Thomas Henry Qualtrough at this time except it has been established that he died between the years of 1925 and 1955. Edward Henry’s (now known as Henry) life took some sad twists and turns over his adult years and ended very tragically and traumatically in 1955. Henry became a baker and worked for Weston’s Quality Breads and Cakes of 914 Umgeni Road, Durban at the time of his death. His deceased estate records at the Natal Archives gives details surrounding his situation at death and his cause of death. It states that both his parents were deceased and that he was a widower. He had married Jean Rowan (McKenzie) Ayres in May 1954, her second marriage, and Jean had died tragically on 2 July 1954 at Addington Hospital, Durban. So Henry was married for less than two months. How sad! But more was to happen to poor Henry who himself would be dead with a year. On May 1st 1955, according to a letter written on 11 November 1955 to Master of Supreme Court by attorneys LD Wartski & partners: "The Deceased met his death as a result of being shot in circumstances which have led to a charge of murder against the person who is alleged to have shot him.. The accused has been committed to trial but the trial has not yet been set down. .."
Amongst Henry’s estate records is mention of the fact that his sister Margaret was the informant, his Executrix and present at his death! Margaret was also the sole beneficiary. At this time nothing else is known surrounding any trial and who was the accused. The estate included the family home at 66 McArthur Street, a Willys car, domestic furniture, and a bank account and an insurance totalling about 2625 pounds. Henry is buried near his mother in Stellawood Cemetery. 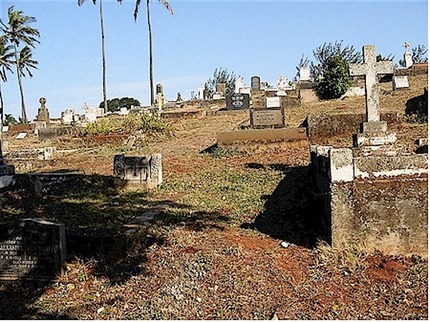 Photo showing the grassed area (near centre) where Emily Mary Qualtrough and her son Henry (Edward Henry)Qualtrough are buried in Stellawood Cemetery, Durban, Natal, South Africa. Unfortunately there are no headstones in their memory or from which to gain further information. As to Margaret, nothing more is known of her. With her inheritance, and not being married at the time of Henry’s death, perhaps she left Durban for a new life somewhere else, or perhaps she subsequently got married, who knows! There may or may not be any descendants but research is continuing to attempt to locate information on Thomas Henry Qualtrough’s death and also to track some sort of record of Margaret’s movements. This will take time but a genealogist never gives up till all clues are exhausted. Rosemary Dixon-Smith also located other references to Qualtroughs in her indexes and they are still being located. These Qualtroughs lived in Transvaal Province, South Africa and I am hopeful that soon I will have further information on them from the Transvaal Archives in Pretoria. 1. Emily Qualtrough (nee Russell) Copeman who died in 1944 and was survived by her husband Edward William Copeman. 2. John Samuel Qualtrough Watterson who died in 1950 and was survived by his wife Ellen Watterson. 3. John Qualtrough Watterson who died in 1971 and was survived by his wife Dorothy Helen Watterson.